I’ve been clearing out our garage and in this process have been sorting through boxes of family memorabilia: photos, diplomas, report cards, letters, greeting cards. My grandmother, and then my mom, saved every single card she was ever given and after she and my grandfather were married saved every card he was ever given. I inherited these stacks and stacks of greeting cards and have been sorting through them, finding love notes and letters and viewing the love affair of Thomas Warren Goulette and Reta Fern Inman Goulette that extended over five decades. There’s a depth to these Hallmark cards, a beauty of a love I witnessed as a child and young adult. My grandparents, while imperfect, were madly, deeply and truly in-love with each other their whole lives. They set the standard for me for what a marriage should be. 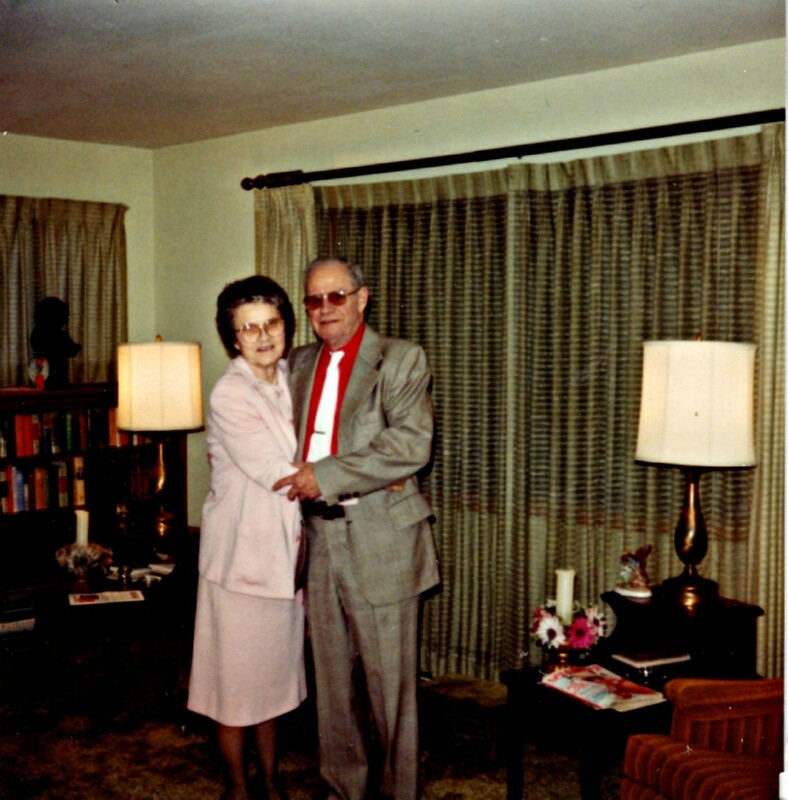 My grandmother loved my grandfather, she cared for him and tended to him during his long battle with lung cancer and emphysema. She doted on him and the look in her eyes when she talked of him and to him was breath-taking. My grandfather loved my grandmother with a passion that can best be related by the story of his death: My grandfather had been dying, fighting cancer for over a year. The doctors had been saying that whole year that he only had a few months left and every time he lived past their prognosis they gave him another month, max. What the doctor’s didn’t know is that my grandfather had promised my grandmother he would live long enough for them to celebrate their 50th wedding anniversary. It was so important to my grandma to have that 50th anniversary, my grandfather knew this. He fought to stay alive and they celebrated it with him in a hospice bed in their living room. Two months later he passed away. My grandfather did everything he could, always, to give my grandmother what she wanted. This came through in material things of course, and also in non-material things: how he lovingly collected walnuts from the walnut tree and cracked them (hundreds of them!) by hand every fall and set them out to dry so Grandma could use them in her baking; how he stood by her, holding and supporting her while she watched her daughter and granddaughter’s relationship fall to pieces; making sure that she took care of herself instead of always taking care of others. My grandparents set the standard for romantic love. I wanted a love affair like theirs, one that would last the test of time. I wanted a partner who would be as devoted to me as my grandfather was to my grandmother, fighting back Death himself, to give her her heart’s desire. I wanted to have a love that flowed so deep from my heart that people knew by the look on my face when I spoke of my husband how deep that love was. I wanted what they had. I didn’t see their hard times, except in the last years when Death came knocking. I didn’t see them fight or argue. I didn’t see how hard it was for them to be parents or know of their struggles, financial and otherwise. I only knew they loved each other with a passion that couldn’t be measured or described. And that in the end is what matters. Not the details of day to day living, but the eternal love we have for those we share those days with. I’m blessed to share my life with a man who makes my heart sing, who makes me want to be a better person, who I enjoy staying up all night talking to and who I miss desperately when we are apart, even after our nearly two decades together. I am blessed that we have an amazing little girl together and that we have our daily struggles, as all families do, and at the end of the day we know that we love each other with a passion beyond measure. I’m not reliving my grandparent’s love affair, theirs was in another time and place. Their love for each other was uniquely theirs and theirs alone. I do have what they had though. Realizing this as I read birthday and anniversary cards from a time before I was born has been a beautiful, awesome, centering and humbling experience. For all their flaws, and there were many, they showed me how to live passionately and deeply in-love. And in the end, I believe that maybe, that is all that matters: that we live each day passionately and deeply in love. The mistakes we make, our flaws and imperfections, at the end of lifetime or the end of a day, can be forgiven if we lived passionately and deeply in love, every moment. The details of their daily foibles don’t seem to matter or to make these people I knew and love, what I remember is their love: their love for each other, their love for our family. This love is what has guided me even when I didn’t know it, it has defined me in ways I have been unaware of or unable to fully comprehend. It all boils down to love. Our love of those close to us. Our love of our lives. Of love for the world. Expressing our love for all to see, stepping into that vulnerability and not caring what the world thinks, because our love is so strong, so robust and beautiful, the world can’t truly hurt us. Acknowledging this love has been a powerful gift over the past few days. I’ve wept, missing my mama and grandparents. Having questions and wanting to know the stories behind certain photos or letters and knowing these questions won’t be answered in this life. Coming to a place of acceptance that those details don’t really matter has been deeply personally profound. Releasing and opening, breathing in deeply the lessons they offer me over a decade after their deaths, has shown me how eternal love truly is. And that is a beautiful lesson to receive.